I want to start by saying how nice it is to share what I’m learning with all of you. Your responses remind me of something I already know, but sometimes forget, that we are all much more alike than we are different. With that said, here’s another new idea I’m trying out. I’ve started getting up about 30 minutes earlier than usual to meditate and read/study. Thirty minutes earlier, for me, is about 4:45 or 5:00 a.m. Let me just say, I’m a sleeper. I love to sleep, and I really love to SLEEP IN. I am not one of those people who rises bright-eyed and bushy-tailed with the sun. No, the sun can be doing its thing and I am still sleeping like a baby. Any of our friends who stay with us can attest to the fact that I am typically the last person to make it to the kitchen in the morning. Everyone is usually sitting around on their second cup of coffee when I saunter out. So, making the commitment to get up even earlier than I already do for work, is really saying something. But, wait for it, I have to admit it’s pretty magical. This practice was suggested by our teachers, and I thought I’d give it a try. It’s important to pick a pleasant quiet spot, a place that feels good to you. I chose a corner in my living room, close to the windows. 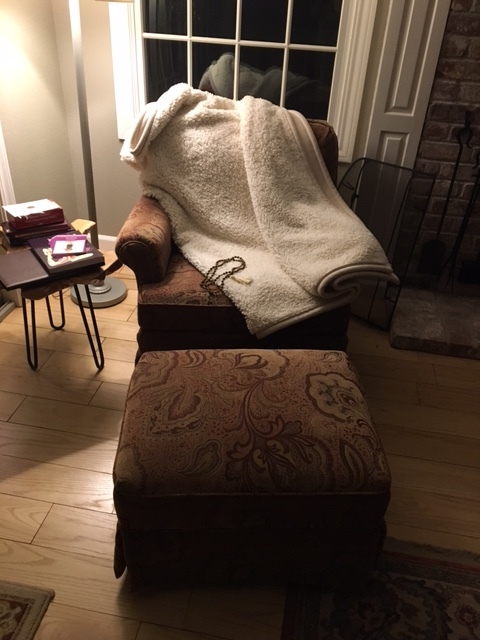 It’s still dark at that time, so I turn the light on over the chair on the lowest setting, grab something warm to drink, and nestle into the chair with my favorite blanket. Our assignments include meditating, reading, chanting, journaling, so I have plenty to do. There really is something special about the wee morning hours, it’s so quiet and peaceful. I enjoyed it so much the first morning I tried it, that I’ve done it every morning since. It’s quickly becoming a favorite part of my day. Early morning (sorry, Cassie, I’ll understand if this isn’t your favorite post) is really such a wondrous time, peaceful and serene and full of promise. I find a marked difference in what I retain when I read early, as opposed to during the day or at the end of the day when I’m tired. And with that thinking in mind, if we need to problem solve, let’s say, a dilemma at our workplace, or trouble with our children or our mate, parents, friends, whatever, the same principles must apply. Giving yourself a quiet time where you can concentrate fully on problem solving, the end result can’t help but be different. Really, is it any wonder that I am able to stay worried or upset about a problem for long periods of time, when I don’t set myself up for success? Comparing it to the workplace, it’s unlikely a manager would schedule an important meeting with his employees to work on an upcoming project, and then invite a traveling circus to assemble in the conference room as well. I don’t know about you, but on any given day, my mind can be a little bit like a circus! Anyway, you get the point. Just thirty minutes even once a week can’t help but bring about some positive thoughts/realizations/inspirations/solutions, on top of the fact that meditation is healthy for your heart/blood pressure/digestion just to name a few. Last night I woke up about 3:00 and stayed awake for quite some time, so many thoughts going through my mind (hey, could you keep it down, I’m trying to sleep here) until just about the time the alarm was going to go off. Of course, that’s when I was just starting to sink back into some nice sleep. Surprisingly when my alarm did go off, even though I was tired, I decided I would still get up because I knew that the 30-45 minutes I spent with my morning meditation would probably bring me a greater reward than trying to get in that extra sleep. And my new-found ritual did not disappoint. I think this one’s a keeper. Let me know if any of you try it. I’ll be interested to see if you find it as enjoyable and beneficial as I do. There are many different ways you might spend your time, whatever feels right for you. I like to meditate for the first half of my time, and then read and plan the second half, but that’s just me. Whatever you do, make it pleasant, whatever that means for you. I am excited for my next post. It might be a little lengthy, so if I’m able to complete it today I will post it tomorrow. If not, it will be my first one next week. Have a great day all. And as always, thanks for tunin’ in. You don’t know how fun it is to hear about you getting up so early in the morning. As you know, I have never been a big sleeper so this is all too familiar to me sissy. I remember how easy it was for you to fall asleep , how well you used to sleep, and how many hours you needed to rest of that pretty head of yours. There is something about the early morning that is very exhilarating. Like you said, it’s a good time to take time for yourself, gather your thoughts, and plan out your day. It’s a great time of the day to take a nice walk, (in the warmer mornings of course), it’s a great time to study. Sleep is very needed, but too much sleep can take up too much of your day or night. That’s why I go to sleep late, and wake up early. I love learning all the revelations that are taking place in your life. Many of your revelations inspire me to rethink the way I think about things. Waking up early may not be one of them because I already do that but there have been many practices that you are learning that I want to put into place myself. Continue growing and continue the enthusiasm… I am having with it fun too! Love you. Ha ha, yes, you have been ahead of me in that department for years! Thanks for your encouraging words. As always, they mean so much. Love you.